Alessandro Del Piero (born November 9, 1974 in Conegliano, Veneto) is an Italian World Cup-winning footballer who plays for Serie A club Juventus. Del Piero was named in the FIFA 100, a list of the 125 greatest living footballers selected by Pelé as a part of FIFA's centenary celebrations. Del Piero was also voted in the list of best European players for the past 50 years in the UEFA Golden Jubilee Poll. In the year 2000, Del Piero was the world's best-paid football player from salary, bonuses and advertising revenue. Along with three awards in Italy for gentlemanly conduct he has also won the Golden Foot award, which pertains to personality and playing ability. 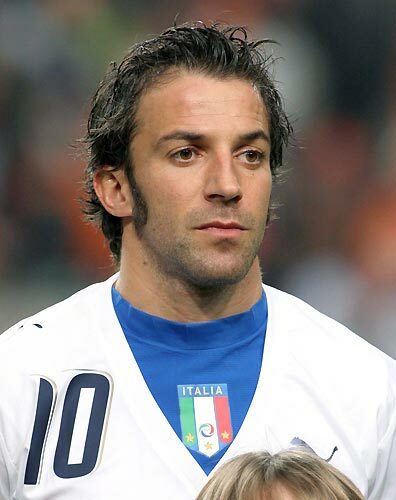 Del Piero usually plays as a supporting-striker and occasionally between the midfield and the strikers, known in Italy as the "trequartista" position. Although he is not very tall, Del Piero's playing style is regarded by critics as creative in attacking, assisting many goals as well as scoring himself, as opposed to just "goal poaching." His free-kick and penalty taking is also highly regarded. Del Piero has become famous over the years for scoring from a special "Del Piero Zone"("Gol alla Del Piero"), approaching from the left flank and curling a precise lob into the far top corner of the goal.